Ask fellow campers about "Driftwood Inn & RV Park" and nearby attractions. Staff was friendly and helpful. Our guidebook stated rates were $40-$45 but it was actually $69. Overpriced for what we got. Showers were nice and clean but we had to keep up with and leave a deposit for a bathhouse key. Our site was in clear view of a junkyard across the street. I mentioned this to the desk lady when I checked out and she didn't seem to know what I was talking about. Some sights do have a beach view. Some campers seem to be there on a permanent basis. We camped at Driftwood Inn & RV Park in a Truck Camper. Our site was pretty tight. Unkept grassy area. Back in and somewhat tight. A must to unhook. We camped at Driftwood Inn & RV Park in a Fifth Wheel. Very nice staff. Most sites were tight but acceptable. Wifi worked good as did utilities. I could not get the cable to work but it was not their fault. Hooking up a separate box to my system was more difficult than I expected. Good central location to Homer. If you pay for a water/bay view site make sure it is unobstructed. There are only 2-3 and the one we were originally assigned to was blocked by trees and bushes. We could see the bay but not real well. Staff agreed to move us to a different site and credit the difference. We would stay here again. We camped at Driftwood Inn & RV Park in a Motorhome. Don't miss Two Sisters bakery within walking distance from RV park. AJ's steakhouse across the street was good also. The office staff can tell you of some good drives to look over the spit and town. 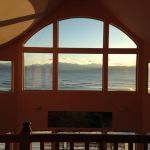 Beautiful views from our site of Kachemak Bay although this is not a "waterfront" site there is nothing between the site and the bay but a road and berm. The campground is tight for a 40' motorhome but it did fit. Staff was very friendly and helpful, WIFI, cable & utilities were good. Convenient to everything in Homer but a bit on the pricey side for the amenities. If you stay here be sure to check out the lounge area next to the office, very nice and "cozy". We camped at Driftwood Inn & RV Park in a Motorhome. Small gravel sites, no trees, but right on the water with mountain views. Two blocks from downtown, clean and friendly. Very good Wi-Fi and cable TV. Extremely helpful staff. We camped at Driftwood Inn & RV Park in a Fifth Wheel. This RV park is small and is not the best for big rigs; although, they are able to squeeze a couple of larger RV's in. There are a couple of permanent units in the middle of the small lot, and vehicles parked at odd angles, making navigation a bit of a problem. The hook-ups all worked great, and the staff was friendly and helpful. There is a good restaurant just across the street, and a nice coffee shop/bakery just a couple of blocks away. There is a beach access path just across the road. We found this RV park to be much quieter and less windy than the ones we drove by on the spit. We would stay here again. We camped at Driftwood Inn & RV Park in a Fifth Wheel. This was a nice, reasonably priced (for Homer) place to spend the night. This RV park is located in old town Homer, right across the street from the ocean and is co-joined with the Driftwood Inn, apparently a landmark historical inn in Homer. The people who manage and run it are very nice. They have free coffee for both their inn guests and for their RV guests. There are also a limited amount of breakfast goodies available for purchase. There is a small playground for young children to enjoy. The Wi-Fi is free and exceptional, such an important component for those of us who have been on the road for weeks as a way of communicating. The restroom situation is a little strange, but OK once you get used to it. There are two toilet areas and two shower areas. They are in the same room as the laundry facilities, and there is a code that people use to enter. However, both men and women are in the shower and bathroom facility area at the same time. It would be nice if that was a little different, but it is probably difficult to do in an older facility. We would stay here again on a return to Homer. We camped at Driftwood Inn & RV Park in a Truck Camper. Pros: On the waterfront. Very clean and modern facility. Full hookups including TV. Bathrooms and laundry facilities top notch but need more showers (see below). Central lodge quite nice with BBQ available. Cons:  OBSCENELY expensive!! More than double the price of other campgrounds on the spit! One male staff member on duty in front who consistently makes people feel like he is doing them a favor by taking care of them. Not very welcoming at these prices! Showers -- at peak times better sign up the night before when you want to take a shower or you will wait a LONG time in the morning! 'Free Wi-Fi' -- very slow connection that becomes almost useless around dinner time and later. Free Wi-Fi much faster provided by Homer -- pitiful and cheap on their part. They could pay for more bandwidth for guests! We camped at Driftwood Inn & RV Park in a Motorhome. Very small and tight RV Park. Very clean spaces with clean showers and restrooms. Good location close to downtown Homer. Staff very friendly and helpful. Would recommend. We camped at Driftwood Inn & RV Park in a Motorhome. There are about 8 slots that overlook the water. The park is small and quite crowded. Basically a gravel parking lot. Park run down but in a good location for walking into the little town. A Safeway nearby. Homer Spit about 2 miles away. Office staff really friendly and very helpful getting me info on a hire car and making phone calls. We camped at Driftwood Inn & RV Park in a Motorhome. Cramped and noisy. We paid for two nights, but left after the first, sleepless one. Located conveniently to Bishop Beach, but that's not much consolation after a bad night. Permanent residents are messy and one was banging on the tailgate of his pickup at 6:30 AM. The pub across the street is a real negative if you want to sleep. This was our ONLY bad experience in Alaska. We camped at Driftwood Inn & RV Park in a Motorhome. Campground is tight for maneuvering but sites are not bad. Easy walk to the beach and the visitor's center. Great views. Staff were friendly and helpful. We camped at Driftwood Inn & RV Park in a Travel Trailer. Small park in Homer with pull-in sites for nice views of the bay. Not spacious and not easy for larger rigs to maneuver with several rather derelict units but fairly level with good cable and wi-fi. 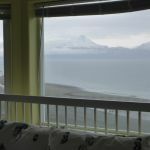 Within walking distance to the Alaska Maritime NWF and visitor center. We picked this park to avoid the crush and noise of the spit but the spit didn't seem as bad as we thought it would be whereas this park got quite a bit of noise from the pub across the street on Friday night. We wouldn't stay here again, far too expensive when all it really offers is cable and free wi-fi (free if you sign in every hour), we can get a small, cramped site anywhere. We camped at Driftwood Inn & RV Park in a Motorhome. This park is really cramped. It would be great if they would reduce the size by about 6 sites and make the remaining sites large enough for modern RVs. It would be fine for Class C or smaller Class A motorhomes, as these could pull into the sites and face the water, but if you have a 5th wheel and need to back in, the hookups are on the wrong side of the unit, and you have to pull the cords/hoses diagonally underneath the unit. Big pain. Your slideouts will be very close to your neighbors. Everything costs extra. Wi-fi is available, but costs. You leave a $5 deposit for the laundry/bathroom key. Sites are so small I had to park my truck on the street and not at the site. The view across Kachemak Bay is great, but the park is a holdover from years past. We camped at Driftwood Inn & RV Park in a Fifth Wheel. Nice waterfront view, some spaces spacious, others rather cramped. Only 1 pull through, sites with view are pull in. Will come back in a heartbeat. We camped at Driftwood Inn & RV Park in a Motorhome. Are you affiliated with Driftwood Inn & RV Park ?